Waiheke Island, 45 minutes by ferry from the city centre of Auckland. And wine, loads of wine. 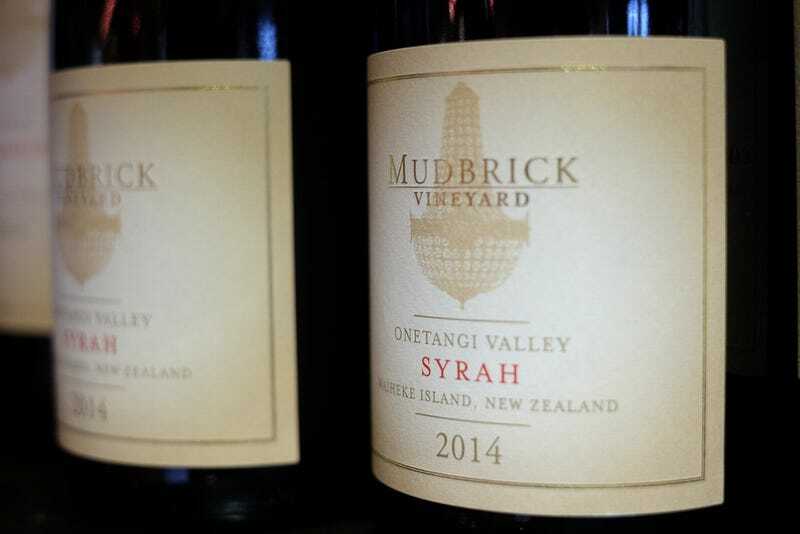 The island has kind of the ideal climate to produce wine, sort of an hybrid between what you can get from Bordeaux or Côtes du Rhône in terms of climate, but with a vastly different soil, New Zealand being somewhat of a huge volcano. We spent the day on the island, went to a few different wineries to taste the wine they had to offer. They were all amazing wines, white, red or rosé, absolutely great wines. We started our journey by a stop at the Cable Bay Vineyards which greated us with this wonderful view of the Hauraki gulf with Auckland in hte mist (you can distinguish the Skytower in the middle). Then we moved to the Mudbrick vineyard (leading picture), where we tasted only white wines. I was treated to a wonderful Chardonnay, unlike anything I ever tasted before, and a sweet (and I mean really, really sweet) Riesling. A clock in the tasting room of the vineyard. Then we moved to Goldie Wines, formerly Goldwater Wines which happens to be the oldest winery on the island (since 1978). The winery was donated by its owner in 2010 (or so) to the University of Auckland which now runs a wine science program from there. And the vineyard is widely used for other venues such as weddings. Went to grab a bite to eat at Stonyridge. To finish our wine tasting journey we went over to Man o’ War which is the biggest winery on the island, and also the furthest from any population. It’s also an active sheep (surprise!) and cow farm. Following the name of the winery, their red wines are named after famous war vessels like Ironclad, Warspite, Dreadnought or Bellerophon, while their whites have names like Gravestone or Valhalla. I only tasted reds, really wonderful, strong wines. The Warspite I tasted was 15% of alcohol (!! ), never seen anything like that even in southern France. Most of the red wines I’ve seen on the island have around 14% alcohol minimum. Did I mention Man o’ War’s tasting room and venue is located right on the ocean? Well now you know, here’s Man o’ War bay. We got back on the ferry at 7pm, after hanging around Oneroa, the main “town” of the island. Here it is on our arrival back in Auckland. All pictures were taken on a Fujifilm X-A1, with a Fujifilm XF35 f/1.4 lens, processed in Lightroom at various degrees (the clock having seen the heaviest of post-processing).